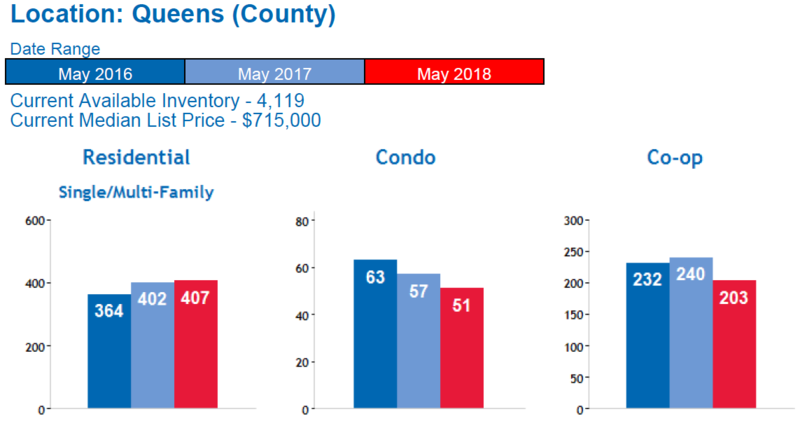 Queens Real Estate Market Report June 2018, provided by the Queens Home Team at Keller Williams Realty Landmark II. Need help? Feel free to Contact Us anytime. May sales continued their downward trend in May. For the last 6 months, home sales have been down when compared to the same month of the previous year. Inventory at this time is actually higher than it was last year so the dip in sales is most likely a result of less demand and less likely a result of lack of inventory. The biggest drop in sales has been with Coops and Condos, residential home sales on the other hand have been consistent with year ago levels. As for home prices, they continue on an upward trend. Every month this year has seen an increase over the prices we saw in the same month of last year. 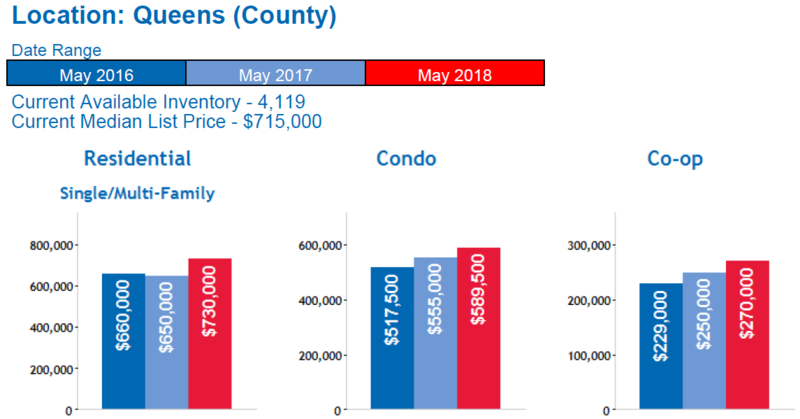 In May, the median home price in Queens was up 17.9% over May of last year, this is a very significant increase and driven in large part to the increase in residential home prices. Coop and Condo prices are also up, but not as significantly as the residential 1-3 family home prices. All in all, what we’re finding is that there are a lot of markets within markets here in Queens. In other words, some areas and property types are still hot, while others are cooling off, and some are even suffering from less demand and a higher inventory. Every area is different, but for the most part we’re finding that there are less buyers on the high end of the market and much more buyers looking in the more affordable price points. Single family homes priced at or around $1M seem to be taking longer to sell, while 1 families around $500K are still in high demand. Multi family homes are still in high demand as well. Coops and condos tend to vary by building and neighborhood, but they have still been in demand as well. What is Absorption Rate? Absorption rate is the rate at which homes sell in a given area during a given time period. Absorption rate is calculated by dividing the number of sales in a given month by the number of available homes for sale. For example, if there are 100 homes listed for sale in a certain area, and 10 homes sold over the last month, then the absorption rate is 10/100 = 10%. The Long Island Board of Realtors reported Queens home sales at a rate of approximately 661 homes during the month of May. This was a decrease of 6.8 percent from April and a decrease of 5.4 percent from May of last year. Specifically, our Queens real estate market report June 2018 shows that Residential home sales were UP 1.2%, Queens Condo sales were DOWN 10.5%, and Queens Coop sales were DOWN 15.4% compared to May of last year. Over the last 12 months, Queens home sales are UP .2%. The median home price in Queens rose to $560,000 in May, this is an increase of 1.8 percent from April, and an increase of 17.9 percent compared to May of last year. The median home price has increased by approximately $85,000 since last year. Specifically, our Queens real estate market report June 2018 shows that Queens residential home prices are UP 12.3%, Queens Condo prices are UP 6.2%, and Queens Coop prices are UP 8% compared to May of last year. Over the last 12 months, the median home price in Queens is up 15.2%. There is currently a 6.3-month supply of housing inventory in Queens, this is up from the 5.9-month supply we had in April, and up from the 5.8 month supply we had in June of last year. There are currently 4,119 homes for sale in Queens. This is an increase of 6.5 percent compared to last month, and an increase of 6.8% compared to May of last year when there were 3,856 homes for sale in Queens.